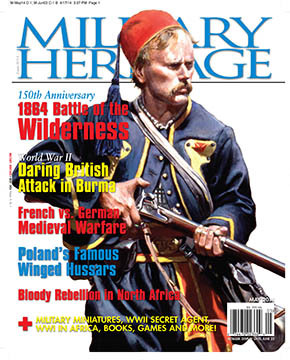 Longstreet's daring advance, Germany's tiger tanks along the Eastern Front and more inside this issue of Military Heritage Magazine. At the Battle of the Wilderness in May 1864, James Longstreet delivered a dramatic blow to the Union Army, designed to secure a decisive Confederate victory. But of course, his wounding halted the attack short of complete success. In “Always Grand in Battle,” Arnold Blumberg takes you south of the Rapidan River, just before midday on May 6. When the head of the Confederate column reached a point perpindicular to the left bank of the Union Army, they halted. The troops then faced north to prepare to advance swiftly through an emerald ravine toward the unsuspecting enemy. As you’ll read in the May 2014 issue of Military Heritage magazine, the result was predictable and fearsome. In addition to our features, this month’s departments include stories about World War I guerrilla leaders, World War II’s Eastern Front and a number of book reviews. Tags Battle of the Wilderness, Burma, Eastern Front, general james longstreet, King Manfred, Moulai Hafid, Rapidan River, Tiger Tank, Union Army.